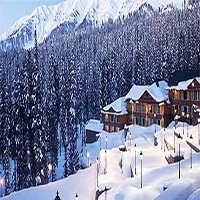 "Gulmarg is a town, a hill station, a popular skiing destination and a notified area committee in the Baramula district of the Indian state of Jammu and Kashmir. The town is situated in the Pirpanjal range in the western Himalayas." Originally named Gaurimarg ("the fair one") by shepherds in honor of the Hindu goddess Parvati,the resort was renamed Gulmarg (â��meadow of flowersâ��) by Sultan Yusuf Shah of the Chak Dynasty who frequented the place with his queen Habba khatoon in the 16th century. Wild flowers of 21 different varieties were collected by the Mughal emperor Jahangir for his gardens in Gulmarg. In the 19th century, British civil servants started using Gulmarg as a retreat to escape summers in North Indian plains. Hunting and golfing were their favorite pastime and three golf courses were established in Gulmarg .